Network structures move beyond serial connections that previously put two devices into communication with one another. Instead, they use network typologies to organize electrical systems into interconnected structures of related components. Most prominently, the fieldbus protocols for industrial networks have set the bar for real-time distributed system control in automated industrial contexts. Fieldbus technology provides an organized hierarchy of controller systems to help manage a distributed control system. Discrete fieldbus networks are sometimes referred to as “device networks”. This network’s control chain starts at the top with the human machine interface, moves to the programmable controllers’ non-time-critical communication system, and bottoms out with the fieldbus that links to individual components, from sensors to actuators, motors, lights, switches, valves, and otherwise. In so doing, fieldbuses provides a means to reduce cable use and overall costs through the integration of control into a single controller communication point and one microprocessor device managing multiple analog and digital connection points. There are many different fieldbus types available, most of which are defined by international standards and are supported by many different manufacturers. The different types of fieldbus are generally not compatible with each other. 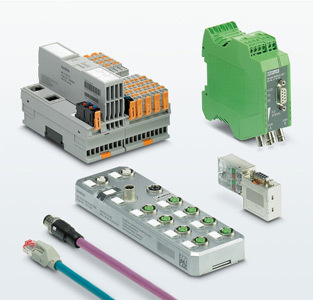 Network and fieldbus technologies types include brands such as: EtherNet/IP; DeviceNet; ControlNet; CompoNet; EtherCAT; PROFIBUS; PROFINET; Ethernet POWERLINK; CANopen; Interbus; CC-Link; Modbus TPC; AS-Interface; and IO-Link.